Review: This will turn out to be a review with which I myself will eventually be the one the least content with. After all, how often have Asian movies been rehashed by Hollywood and the remakes have been an inferior copy of an inventive original work? 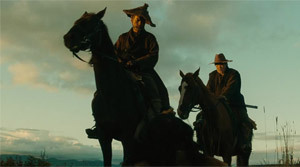 And finally things are the other way around and director Lee Sang-il brings a Japanese remake of the Clint Eastwood western from 1992 by the same name to the screen. That's finally an opportunity to beef about an Asian remake for a change. Unfortunately, I haven't watched the original... Of course you could attempt to point out from a positive angle that this will give you an unprejudiced view on the movie, allowing you to judge whether the movie can stand on its own two feet or simply builds on the nostalgia factor of the original. But don't sugarcoat it: It would have been more interesting if things could have been compared. 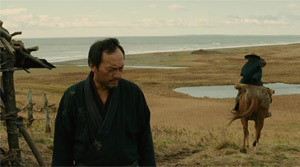 So those who are still reading these lines and haven't looked for one of those many other reviews, written by authors who are cineastically a lot more well-educated, will maybe want to hear a few more words from me about the film, which actually stands as a well-achieved mix of a western and chanbara flick (a samurai movie for those not in the know). First of all, it's important to understand that "Unforgiven" is not an action picture, but a drama that revolves around guilt, revenge and maybe also the chance of atonement. The story's hero carries around an enormous amount of sins on his shoulders and during the course of the story we find out that you don't want to see him lapse into old behavior patterns. Maybe there is still a monster slumbering within, which reawoken after a decade can't be stopped anymore. 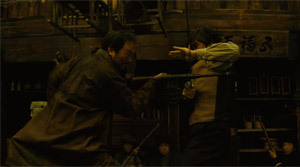 We constantly get small clues that Jubei is no one you want to take on, but particularly during one special scene, in which he doesn't do anything against being brutally beaten up, it becomes clear that he fights his inner demons and doesn't want them to come to the surface. Unfortunately, it needs to be pointed out that despite a leasure pacing and many dialogues there is still a lack of depth, a depth which you actually would expect. And this is in fact one of those aspects many critics, who compared the film with Eastwood's original work, found fault with. But even without knowing the source material it catches your eye that Lee Sang-il ("Villain", "Scrap Heaven") often remains at the surface and when things start to get interesting, he doesn't know where to put his next steps. Especially in a movie that is thriving on its individuals and broken heroes this is a shame. However, I don't want to give the impression that the individuals are uninteresting or come across as absolutely shallow. Far from it. There just would have been potential for more. This also concerns Ken Watanabe, who more than anything else gained fame through his Hollywood roles like in "The Last Samurai" or "Memoirs of a Geisha". He may deliver a nice performance, but it still somehow lacks the finishing touches. Particularly the subtle scenes almost remain a tad too... subtle. Koichi Sato ("Dearest") as the villain also can't show as much of himself as we might have wished for. Because even though he might be loathsome, he still acts according to certain principles, doesn't hit women or is content with embarrassing an aged samurai instead of killing him. There was again the potential for more. Kingo, played by Akira Emoto ("Rain Fall"), also lets us assume a lot about his past, but in the end he remains too flat. Yet, it's most importantly the ladies of easy virtue, resp. Natsume, we would have liked to see more character elaboration done for. Apart from that the story actually knows how to illuminate themes like sins and what it means to constantly carry them around with you. Killing itself is also always depicted as something cruel and violent or even animalistic. For many it remains a traumatic experience. 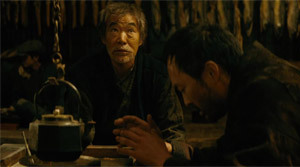 Nevertheless, the film doesn't leave us high and dry and delivers a bloody showdown. 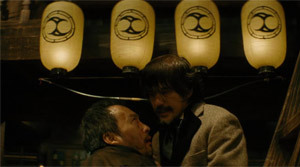 Even though it might turn out a bit shorter and more importantly less spectacular than we are used to from most chanbara flicks it still fits to the more drama-heavy tone of the movie and manages to satisfy. Luckily, "Unforgiven" also remains subtle when it comes to the drama and doesn't overdo things. 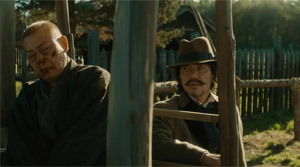 The story is enframed by nice pictures, which show the vastness of the landscape especially well and thus clearly take a page out of the western genre's book. The integrated subplot around the Ainu, the natives of the isle, doesn't just stand as an analogy to Native Americans, but is in general an interesting aspect of the story. 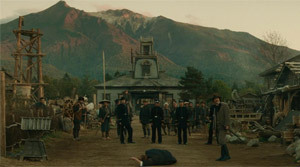 In the end, "Unforgiven" proves to be a nice mix between west and east and whets the appetite for watching the original. Thus, you can in fact call this a well done movie.